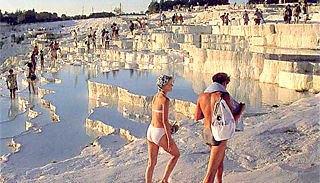 Pamukkale (Hierapolis) is both, a magical and spectacular natural site, unique in the world and with its ancient ruins it is perhaps the most attractive spot for tourists. 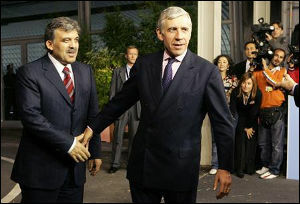 Turkey opened historic membership negotiations with the European Union on Tuesday 4 October, 2005. It was first given the prospect of membership in the wealthy European bloc after 42 years. Would you change your religion for your love? There is a feverish discussion in Turkey nowadays. Tugce Kazaz, a beautiful Turkish top model, changed her religion becuase of her Greek Love, Yorgo Seitaridis. They married in Greece and she announced that she became a Christian. Why people love to travel to Turkey?